On 19th July 2016, H.E. 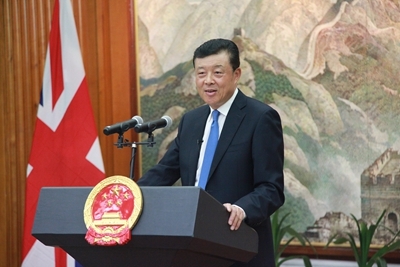 Ambassador Liu Xiaoming held a press conference at the Chinese Embassy on the so-called ruling of the arbitral tribunal in the South China Sea arbitration. He expounded in full China's solemn position on the so-called ruling and revealed the illegal nature of the arbitration case and the fundamental causes of the so-called tension in the South China Sea. He reaffirmed China's steadfast position that it will endeavor to peacefully resolve relevant disputes in the South China Sea with parties directly concerned through negotiation and consultation on the basis of respecting historical facts and in accordance with international law. 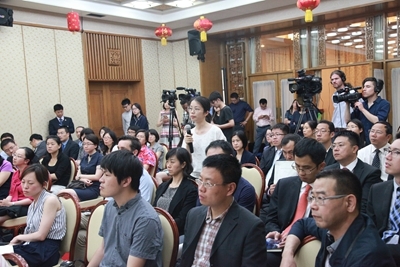 The Financial Times and the Daily Telegraph of the UK, and Xinhua News Agency, People's Daily, CCTV, China Daily, China Radio International, China.com.cn of China reported on the press conference on 20th July. China Daily: I'm from China Daily. 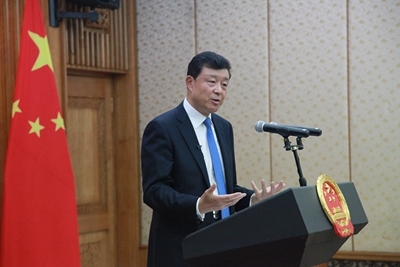 Chinese President Xi Jinping said that China is committed to peacefully resolving relevant disputes through direct negotiations. But he also said that national sovereignty and maritime interests will not be influenced under any circumstances by the ruling. So my question is, outside these two areas he mentioned, what are the areas that China is willing to negotiate? Thank you. Ambassador Liu: The position that President Xi elaborates is the consistent policy of China. When it comes to the issue of South China Sea, our position is clear and consistent. We have sovereignty over the islands in the South China Sea. And we also realize there are disputes on some of the islands. So we propose to "shelf the differences and seek joint development." This principle has twelve Chinese words: Sovereignty belongs to China, differences can be shelved and parties seek joint development. So, China will not negotiate its sovereignty on the islands of the South China Sea, but we realize that there are disputes over some of the islands and we are ready to have negotiations and consultations to ensure that the disputes will be resolved by peaceful means and through diplomatic negotiations. 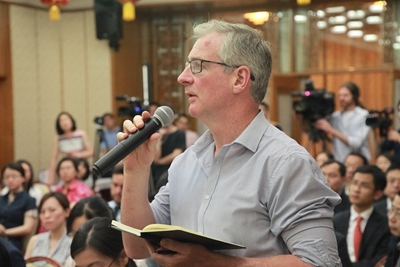 Xinhua: My question is about a law research paper by former deputy legal advisor to the Foreign and Commonwealth Office, Chris Whomersley. 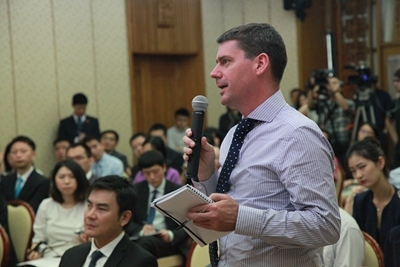 Chris Whomersley argued in a recent research paper that the tribunal's argument is "not convincing" and the way the tribunal handles the arbitration case is "potentially destabilizing" to international relations because it actually allowed the Philippines to resile, abandon its undertakings in a formal document like the DECLARATION ON THE CONDUCT OF PARTIES IN THE SOUTH CHINA SEA (DOC). Could you briefly comment on this argument of Chris Whomersley and to what extent do you think it is true? Ambassador Liu: I happen to agree with him. I always oppose the arbitration. I would say, it set a very bad example. Some people believe it belongs to the dustbin. Some people believe it belongs to the museum. I was a student of international law. I believe it should be regarded as a negative example for teaching because it will be remembered in the history books as a failed case. It has violated international law in many aspects. To begin with, I would say it violates the basic purpose of UN Convention on the Law of the Sea(UNCLOS). The purpose of UNCLOS is to ensure the stable and peaceful environment of oceans and also relations between states. Yet this tribunal, instead of serving the purpose of UNCLOS, caused further tension between countries. It denied the diplomatic channel of negotiations for solution. It even denied the legal status of the DOC which is a very solemn official document reached by China and 10 ASEAN countries. So it did not serve the purpose of finding a solution peacefully. Rather it added fuel to the fire of the already intensified relations of the countries concerned. Also it added fuel to the fire of the tense situation in the region. So it is a very bad practice. As I said in my opening remarks, China will not recognize it, or accept it. It has no binding force. And we also hope that no country will take the ruling seriously. No country will make further claims based on the so-called ruling. The ruling is illegal. It has no legal status. If new claims were to be made based on the ruling, it would lead to new illegal actions that will further endanger regional peace and stability. Propeller TV: I am from Propeller TV. Do you think there have been any implications from the Philippine government about a turnaround in China-Philippines relations? Thank you. Ambassador Liu: We certainly hope so. Since President Duterte took office, we have heard some encouraging words, positive comments, that he'd like to see China and the Philippines maintain good relations, that he'd like to see China and the Philippines resolve these disputes through bilateral negotiations. In fact, that is what we have been working for over many years. That is why we strongly oppose this imposed arbitration from the very start. We believe this arbitration would lead to nowhere. So we still believe, as I said, that negotiation is the only way that can lead to a solution. So we are open to cooperation with the new government of the Philippines, and we certainly expect further actions from the Philippine new government. As you know, there is a saying in Chinese, "listen to what you say, but watch what you are going to do." I do hope that their action will match their words, and we can start bilateral negotiations and set relations back to its normal track. China and the Philippines are neighbouring countries across the sea. And China and the Philippines have enjoyed very good relations for thousands of years. We always believe that disputes will not prevent the two countries from having good relations. And, we do hope that President Duterte and his government contribute to new prospects in China-Philippine relations. Financial Times: I would like to just ask you for a bit more explanation on the question of the tribunal itself. From what I've read, China's main objection to the tribunal is, first of all, that an arbitration should be agreed to by both parties, and secondly, that the tribunal has no jurisdiction over the ruling that it had. But I've looked at the UNCLOS and there are two articles which appear to run counter to China's position. The first article is article 286, and it says that the interpretation of UNCLOS can be brought by any party to the tribunal. So it doesn't say 'both parties' but 'any party'. The second is 288, which says the question of jurisdiction should be settled by the tribunal itself. So could you explain China's position on that please? Ambassador Liu: We have different views with regard to how articles 288 and 286 should be interpreted. Let me first say that our opposition to this tribunal is not only confined to the points you've made. I advise you to read carefully the Chinese Government statement, the Foreign Ministry statement and the white paper. I have summarized after reading these documents that this tribunal at least violated international law in eight aspects. Firstly, it violated UNCLOS. UNCLOS has no jurisdiction on the matter of territorial sovereignty. This arbitration is about territorial sovereignty, although it is meticulously packaged by the Philippines as a technical case. From the way it ruled, everybody would come to the conclusion that it is about China's sovereignty over the islands in the adjacent waters. Secondly, it violated UNLCLOS in terms of maritime delimitation. China and over 30 countries have already made optional exception statement to exclude from arbitration matters concerning maritime delimitation, historic bays or titles, military nature and law enforcement activities and so on. This optional exception declaration is regarded as part of UNCLOS. Everybody, I believe, agrees that this ruling is pertinent to maritime delimitation and so it has violated UNCLOS. So that is why we are saying the result shows that the tribunal has self-expanded its power and violated China's right under this declaration. The reason why the UNCLOS and the parties agree to include this declaration as part of the legal statement is for the purpose of maintaining stability and harmony since UNLCOS realizes that disputes may arise from the differences in maritime delimitation. If this declaration is denied, it will set a bad example. Today it's China, who will be the next tomorrow? Thirdly, it denied the bilateral agreements that we have already signed. The Philippines has a series of bilateral agreements with China with regard to how to resolve the disputes through diplomatic negotiation. There are a series of bilateral documents, declarations, agreements signed between our two countries. Fourthly, it violated the DOC signed by China and ASEAN countries. DOC is part of international law and this declaration ensures that the parties are committed to maintaining peace and stability in the region through peaceful consultation and negotiation. It plays a very important role and has been respected and adhered to by China and ASEAN countries. Fifthly, The arbitration denied China's sovereignty over the islands, denied China's historical rights, including the dotted line, and challenged the basic norms enshrined in the UN Charter, namely safeguarding state sovereignty, independence and territorial integrity. So the arbitration is a serious violation of international law. 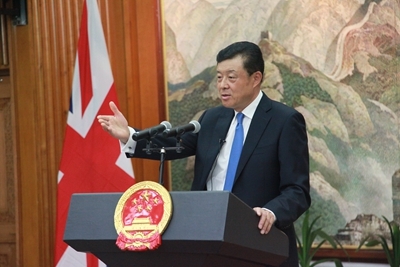 Sixthly, the arbitration, based on a distortion of Article 286, accepted the case and denied China's right to choose the means of dispute settlement of its own will. Seventhly, it set a bad example by misinterpreting the Convention and undermining the integrity and seriousness of UNCLOS. Eighthly, this arbitration deviated from the purpose of UNCLOS to promote peaceful settlement of disputes. Rather, it intensified tension in the region. To come back to the Articles you mentioned, the arbitration has its own right to interpret whether it has jurisdiction or not, but it should have its judgments based on facts. When it comes to the interpretation of an article, in addition to what rights you have, you also have to realize the obligations you have to live up to. So the arbitration only capitalized on the rights but failed to recognize the obligations. The obligation is to respect the UNCLOS provisions on jurisdiction and respect the declaration that China has made to exclude maritime delimitation. So the tribunal itself is not given the absolute right to determine whether it has the jurisdiction or not. Nor is it exempt from its obligations under UNCLOS. People's Daily: I have two questions. Firstly, what do you think is the impact of the so-called arbitration on Sino-Philippine relations? In your opinion, how will the Sino-Philippine relations develop in the future? The second question is, as we all know, over the centuries, even over the recent decades, the South China Sea has been a very peaceful, and very quiet sea. But now it becomes hotter and hotter, and more complicated. What do you think is the reason for that? Ambassador Liu: First of all, the ruling of arbitration certainly has no impact, with no binding force, because we regard it as illegal, and not to be taken as the basis for future negotiations. If the Philippines agrees with us, I think we can resume our bilateral negotiations very soon. If the Philippines takes the ruling as the basis for negotiations, I don't think that will lead us anywhere. I do hope countries in the region will share China's position. We already have some countries which share and support China's position, and some countries have expressed concerns over the consequences of the ruling. I do hope that China and ASEAN countries will reach consensus with regard to what serves the best interests of China and ASEAN, and what serves the best interests of peace and stability of the region. We've heard positive comments from the Philippine new government, but we do not know yet what their position is regarding the ruling. There is no way that we will implement the ruling. I hope the parties concerned will not take further illegal action, which will further escalate the already intensified situation. That's something we do not want to see. 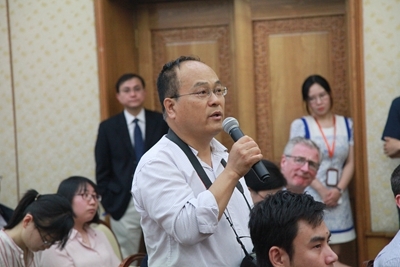 With regards to the second question, before 1970s nobody had challenged China's sovereignty over the South China Sea. The doted-line was widely respected. It had been printed in many official maps published in the U.S, Britain, France, the former Soviet Union and many other countries. After oil and gas were found in 1970s, some regional countries rushed to invade and illegally seize the islands. We had raised strong opposition to this kind of illegal occupation to the countries concerned. As you know, during that time China was going through the Cultural Revolution, and the internal disruption prevented China from reaffirming and safeguarding its sovereignty over these islands. That was very unfortunate. What happened in recent years, I think, had something to do with the so-called rebalancing strategy of the United States. Though we had some problems these years with neighbouring countries, the Philippines, Vietnam, Malaysia, to name a few, we do have bilateral discussions. China and Vietnam had reached agreement on maritime delimitation of the Beibu Bay. We even had a joint development project which includes the Philippines. It was a tripartite agreement on seismetic survey and joint exploitation. But the projects failed to be implemented when the so-called U.S. rebalancing strategy came into being. Those countries were emboldened to challenge China's sovereignty. Now, instead of working behind the scene, the U.S. jumps to the front to challenge China's sovereignty by sending their warships and airplanes to have those close-in reconnaissance on China's air space, territorial sea and waters. These moves are causing tensions. We do hope these tensions will be reduced. We hope to work together with countries concerned, including the United States, so that we can make the South China Sea a sea of peace, sea of cooperation and sea of friendship. That is what has been reiterated by the Chinese leaders when they reaffirmed China's commitment to peace and stability of the region. China Radio International: The Hague Tribunal is a legal institution set up under the framework of a UN convention. 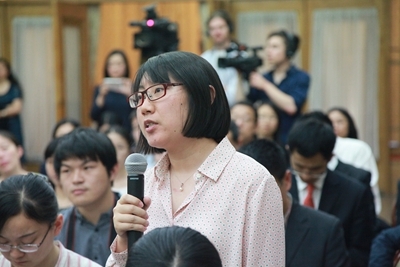 What is China's justification for "not accepting" and "not recognizing" its ruling? And what does it really mean to "not accept" or "not recognize" the arbitration ruling? Does it imply that China will do nothing whatsoever about it? Ambassador Liu: First of all, I would like to correct this argument by pointing out that this tribunal has no relationship with the United Nations. It's not part of the International Court of Justice. It even does not have much to do with the Permanent Court of Arbitration (PCA). This tribunal was set up on a temporary basis at the request of the Philippine government for this arbitration case. Its only relation to the PCA, to my knowledge, is that they use the PCA's venue, the office building, and they borrowed some staff from the PCA secretariat. That's all. Its legal basis was very weak. What I should mention further is the composition of the tribunal, namely the five arbitrators. Apart from one arbitrator designated by the Philippines, all the other four arbitrators were appointed by the Japanese judge Shunji Yanai, who was the then ITLOS President. He used to be the Japanese ambassador to Washington. I am very suspicious of his political motives. He is a policy advisor to the current Japanese Prime Minister Shinzo Abe, and he has helped Abe to change Japan's peaceful constitution and the status of the Japanese armed forces and assisted in lifting the ban on the collective self-defense strategy. This is a person who wanted to challenge the post World War Ⅱorder, and I think this case gave him another reason to do so again. China's sovereignty over the South China Sea islands dates back to 2000 years. In recent time, these islands had been illegally seized by Japan during the Second World War. Later, after the Second World War, they were returned to China under the authorities and articles of the Cairo Declaration and this was reaffirmed by the Portstam Proclamation. If this tribunal were allowed to deny the DOC, and if this case were established, this would embolden other coastal countries to follow suit and incur a string of similar tribunal cases. In the next ruling, maybe they would say that the Cairo Declaration and the Portstam Proclamation had no legal status. I do not know where it would lead. According to Cairo Declaration, all the territories and islands occupied by Japan must be returned to China, including the South China Sea islands. In fact, the military officers of China used the American ships to recover the islands. That the arbitral tribunal characterized Taiping Dao of the Nansha Islands as a "rock", not an island, exposed that the purpose of arbitration is to deny China's sovereignty over the Nansha Islands and relevant maritime rights and interests. This violates international law, and is totally unacceptable. It has been strongly condemned by the Chinese people from both sides of the Taiwan Strait. China did not participate in the arbitration because from day one, we believe this is a political farce. When you look at the composition of the tribunal and the political motives behind the ruling, you will know what the outcome will look like from the very beginning. We know it will lead to nowhere. We naturally showed no interest in it. When China says the ruling has not binding force, it means China will certainly not be bound by this ruling and we also hope that no other country would implement the so-called ruling. As I said, how do you expect this discredited, illegitimate tribunal to make credible rulings? If the rulings were implemented, it would cause further damage to the situation. Daily Telegraph:What would you say when people who are not part of the disputes are saying that China is cherry-picking international law, and yet China is talking about its peaceful rise, it has to follow international law, as like China is following in other areas? Secondly, can you give your thoughts on the way you perceive America's role in these disputes, in the sense that America encourages the Philippines to make this claim? Ambassador Liu:I can't agree with you when you say China is cherry-picking. I think we have a legal basis to argue. Like I have said, there are eight areas in which this tribunal violates international laws. China abided by all the regulations of UNCLOS. China stood behind bilateral agreements, including those signed with the Philippines. And China is committed to the DOC with ASEAN countries. So I would say, China is a country which abides by international law, plays by the rule. The basic law of international law is the UN Charter, and China, being a Permanent Member of Security Council, bears the responsibility of safeguarding the UN Charter. There should be no doubt about it. With regard to the United States, I think there should be a big question mark about US behavior with regard to the South China Sea. They have not ratified the UNCLOS, and they have kept breaching the UNCLOS, yet they acted as if they were the guardian of the UNCLOS. If they love the UNCLOS so much, why couldn't they ratify the UNCLOS? I think they are concerned that the UNCLOS might prevent their so- called freedom of navigation and overflight. They want to go anywhere they want, and they do not want to see any restrictions on them. That's number one. Number two, I think this arbitration case is politically motived. It is part of their strategy. On the one hand, they sent their warships and airplanes to areas close to China. On the other hand, they seized this legal case launched against China, so as to humiliate China diplomatically, damage China's image, and also gave them a legal base to challenge. But I think this intention is doomed to failure, because they do not have a good legal base from the beginning. This has already turned out to be a political farce. So far, we have not heard many countries which are in support of this ruling. Compared to this, we have over 70 countries supporting China's approach. We have about 290 political parties and organizations from over 70 countries expressing their support for China's position, the position that we believe the diplomatic negotiation between sovereign states is the only solution, rather than forced arbitration. We do hope after this ruling, common sense will prevail. 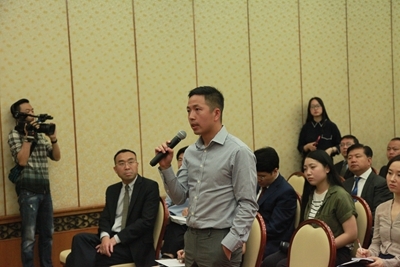 All the coastal countries will come to the negotiation table and accept China's proposal to shelf disputes, and to have a serious diplomatic discussions and work for the joint development. That serves the interests of the countries concerned. We also hope the United States will respect the concerns and rights of China. We believe the US has its interests in the region. But they cannot protect their interests at the expense of other countries' interests. China and our neighboring countries share a common destiny and common interests. China is the last country that is willing to see instability in this region. A lot of trade and commercial commodities go through these channels and shipping lanes. China will continue to safeguard peace, stability, and freedom of navigation and over flight in this region. European Times: Some people say the South China Sea dispute is a challenge of China's view of historical sovereign rights versus America's idea of rule-based international order. How do you view this? Do you think it will be a long lasting dispute? 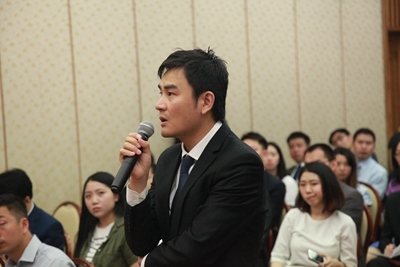 My second question is that you mentioned negotiation is the only solution for the dispute. Are you already in preparation for it? 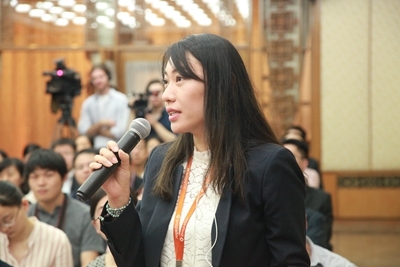 Ambassador Liu: First about your first question about the historical rights that we safeguard. Historical means the rights and interests of China have been formed through the course of history. Some people say China discarded its strategy of "keeping a low profile" and China no longer focuses on its economic development. China is seeking more power. I think that is not correct. In fact, what we are defending is basically what has been ours since ancient times. The dotted line is not a creation of new rights. It was there since 1948 and has been recognized by the international community. It was not until something precious was found under the sea that countries began to seize and invade China's islands. China does not, has not and will not ask for anything more than what belongs to us. As I said in an interview with the Reuters, we are not interested in an inch of land of others. We are not jealous of others. But we treasure what we have. China has lost so many territories when China was very poor, when China was invaded by foreign powers and was subjected to foreign occupation as a result of unequal treaties. So it really is in China's DNA. We will defend China's sovereignty, rights and interests. So I would say we hope the historical rights should be reaffirmed by the international community. China's historical rights had been respected before 1970s by the United States in many historical documents, legal documents, and international law. But things have changed. They have new allies and new interests. In an article I contributed to the World Post, I said "superpowers are used to coming and going." Countries should know that your neighbours are more important than superpowers. You cannot choose your neighbours. You have to live with your neighbours. China does not want to challenge America's position in the world. But we cannot accept an unequal international order. China respects the current international order and China is a beneficiary of this international order. So that is why we said time and again that China would like to work with the international community to safeguard the post-war order. We have no interest to disrupt this order or to start a new order. But the world has changed. You need to keep up with the times. You need to make adjustment in this world order to meet demands, especially from the developing countries. China regards itself as one of the members of the developing countries. As President Xi said, the Pacific ocean is big enough to allow China and the United States to work together, rather than have conflicts with each other. We do hope that the United States will realize that China has no interest to challenge US dominance. We acknowledge that although the US is not a regional country, it has economic and security interests in the region. We respect that. We hope the United States will also respect the interest of China, so that the two largest Pacific countries can work together to maintain peace and stability in the region. Thank you for your presence. I look forward to seeing you again.